This species is accepted, and its native range is E. Nepal to Indo-China and Peninsula Malaysia. 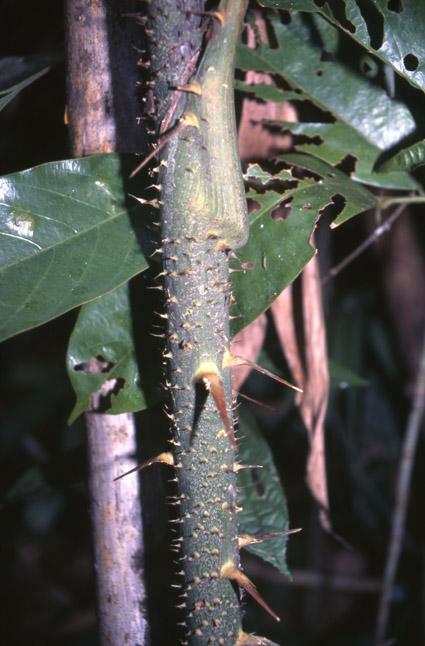 A moderately robust climber; stem cluster forming; with leafsheath 3 cm in diameter. 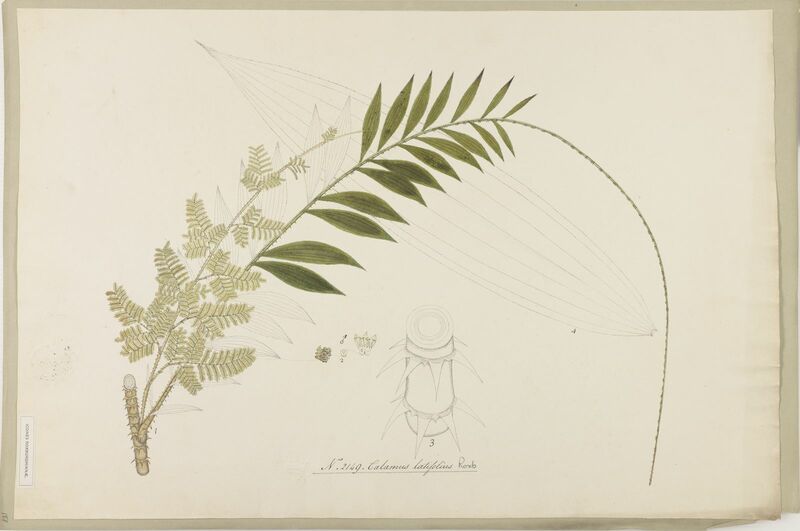 Leaves curate, 2 - 3 m long; leafsheath with prominent knee, armed with subulate, sub-regularly verticillate, dark brown, 3 cm long spines; ocrea liguliform; rachis terete in cross section, without claws on the ventral side, armed only with small spicules; leaflets not many, papery, inequidis-tant on rachis, broadly lanceolate or elliptic-lanceolate, slightly concavo-convex, to 50 cm long, 10 cm wide at broadest part, 5-7 nerved; nerves smooth on both sides. Male inflorescence simply decompound; partial inflorescences twice branched; rachillae 3 - 4 cm long with 8-12 male flowers on each side of the rachilla; the sterile basal part of rachilla enclosed within the respective basal bracts. Male flowers 5 mm long, ovoid in bud; calyx externally striated, divided up to the middle to form 3-acute lobes. Female inflorescence simply decompound, rigid, erect not very diffuse, 60- 100cm long, shorter than leaves; partial inflorescences 4 in number, 15 - 20 cm long, with 4 - 6 rachillae on each side, caudiform at their apices; rachillae inserted just at the mouth of the respective basal bracts; each 5 - 6 cm long, sinuous with 8-10 flowers on each side; involucrophorum enclosed in its bract, cupular; involucre concealed in the involucrophorum, visible only by the two projecting teeth on the side of neuter flower; female flowers 5 mm long; calyx finely striated, deeply divided into broad, semiovate, acute lobes; corolla lobes narrower than calyx lobes. Fruiting perianth not distinctly pedicelliform. 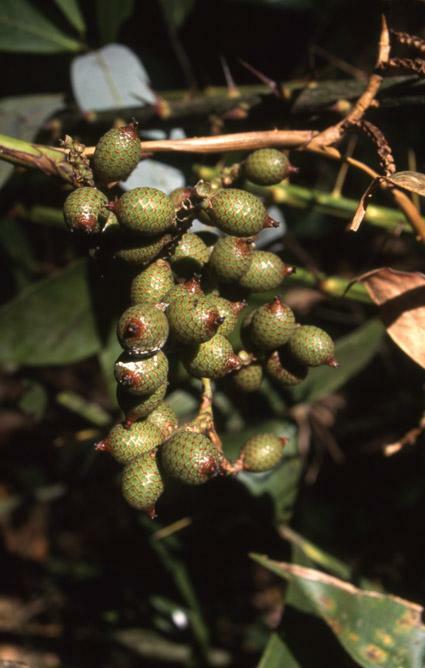 Fruit globose, 1-seeded, dull brown to blackish, to 1.5 cm in diameter, fruit scales flattened, not distinctly channelled at middle; seed globosen blackish, roughly pitted. INDIA (West Bengal, Sikkim, Assam, Arunachal Pradesh, Meghalaya, Nagaland), BANGLADESH. 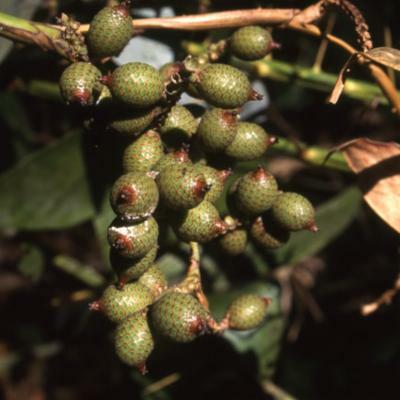 A component of the moist lower hill forests upto 1000 m mostly near the fresh water swamps. wai hangnou, wai namleuang, wai khairt, wai kiyow, wai hom, wai namhang, wai tiukeng, wai savang, wai sard, wai kanebouang (Lao Loum), re tair (Alak), wai kring, wai saikai, wai tiukeng, wai plawk (Thailand). Evergreen forest at 100 - 650 m (Laos), and up to 1300 m (Thailand). Thailand (North, North-east, East, Central, South-east), Laos (all parts), Vietnam (Cochinchina) and Cambodia. Possibly also South and South-east Yunnan (Pei et al. 1989, 1991, but see below). Other varieties occur in India and the Thai-Malay Peninsula (Beccari 1908). Cane is moderately strong and used for making rough baskets, walking sticks, and furniture frames; split canes for weaving chair bottoms. The cane is of high quality and widely traded. The shoot is edible. There are reportedly plantations for cane production in Vietnam (Nguyen Truong Thanh & Ngo Thi Min Duyen 1997). 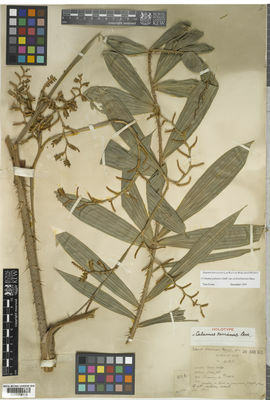 Calamus palustris var. 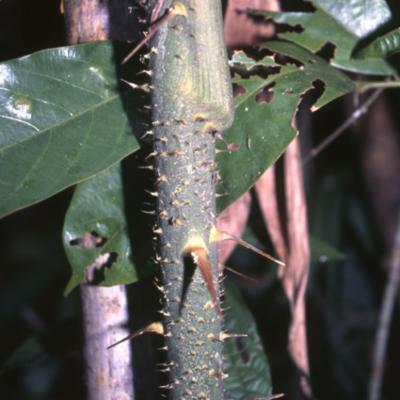 cochinchinensis Becc.